For Fans Of: Toxoplasma, Feine Sahne Fischfilet, Dritte Wahl, SlimeInformation:ALARMSIGNAL are not only celebrating their 18th anniversary this year, but are also presenting themselves with a new album for their anniversary! Founded 18 years ago in Celle, Germany, after several concerts and six longplayers the band has gained a firm place in the German punk rock scene - and the fan community continues to grow from year to year. Three and a half years after their last album "Viva Versus", "Attaque" is finally the seventh and certainly the best and most mature studio album in the starting blocks. 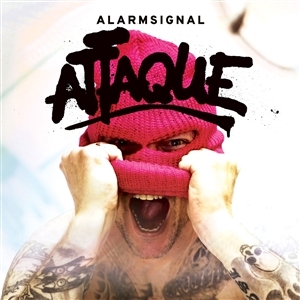 "Attaque" is the consequent further development and still a classic ALARMSIGNAL album. 13 songs that musically underline all forms of emotions. Sometimes aggressive and angry, sometimes downhearted and thoughtful. Packed in mainly hymn-like punk rock, which is often worn by choirs and even in its fast parts never loses the red thread to the melody.